First Annapolis has been closely monitoring the product offerings of the top issuers in several European markets in order to gauge issuers’ reactions to the interchange decreases that went into effect in December 2015. Issuers’ immediate responses to reduced interchange revenues (as observed in January 2016) included rationalizing their product set, reducing rewards, and increasing APRs and annual fees. We predicted that issuers and co-brand partners would continue optimizing their rewards programs and narrowing the customer value proposition of rewards to specific segments such as supermarkets, petrol, and travel in the short-term. Our latest research, covering activity from January through July 2016, confirms our initial hypothesis: issuers continue to rationalize their product set, reduce rewards value, and rely more on fees to drive product revenues. 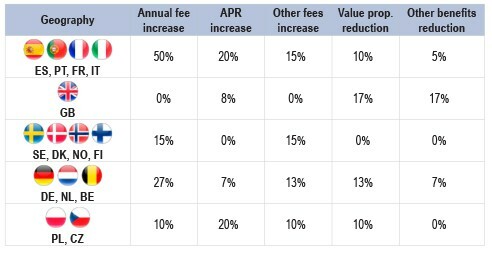 Annual fees (see Figure 1) have continued to increase since January. In Spain, Portugal, France, and Italy, almost half of the top five to six issuers have raised their annual card fees. In France, Credit Mutuel and BNP Paribas have increased annual fees on cards by 2 percent on average. In Spain, the average increase was as high as 26 percent (Caixa Bank and Banco Popular) for cards that saw an upwards price adjustment. In Germany, where interchange hit hard on credit cards (see Figure 2), several large, well known issuers are now charging on average 20 percent more for some of their card offerings than they did in the beginning of 2016. Additionally, one of the largest banks in the Netherlands has increased fees on some of its credit cards by 60 percent. Issuers have also continued increasing credit card APRs since January to compensate for the revenue lost from interchange regulation. Markets where most issuers have increased their APRs include Portugal, Poland, and Italy, where rates have increased by 30 bps, 100 bps, and 131 bps, respectively. Source: First Annapolis Consulting European card product research, company Websites. The total number of products sampled that offer rewards has remained relatively stable: only a few issuers added new rewards to their card products compared to the beginning of the year, primarily on credit cards, while the number of debit card products offering rewards decreased. The value of the rewards offered to cardholders, however, has decreased, particularly in markets where credit card interchange experienced steep declines. Many U.K. issuers decreased rewards dramatically prior to interchange regulations. In continental Europe, more issuers waited until after regulation took effect. For example, in the Czech Republic, where credit card interchange decreased 70-80 bps, Ceska Sporitelna announced that it has eliminated 1 percent cash back on credit card purchases except for e-commerce and foreign purchases. Raiffeisen reduced the maximum monthly cash back reward on its premium card from CZK 1,000 (US$42) to CZK 250 (US$10). In markets such as Spain, where interchange has not been as steep, reductions are concentrated among the most generous programs. Grupo Banco Popular, for example, has reduced the welcome miles for its Iberia Sendo rewards credit card program by approximately 20 percent. Note: Interchange regulation is not currently enforced in Norway, and its local debit scheme operates with no interchange. European issuers have continued raising fees on other products and services. In France, Société Générale has increased the fee when consumers choose their own PIN. In the Czech Republic, Ceska Sporitelna has added additional fees for any transaction made at gambling and adult-services merchants and also increased ATM cash withdrawal fees. KBC (Belgium), Banco Santander (Portugal) and Sydbank (Denmark) have also increased ATM cash withdrawal fees on some cards. Build ways to monetize the vast amounts of data at issuers’ disposal, including using customer data more effectively to make offers to cardholders (both from the issuer and partners) that are more targeted and more integrated into the digital commerce experience. Elisabeth Magnor is a senior analyst specializing in European initiatives for First Annapolis Consulting, a specialized consulting and M&A advisory firm that focuses on the payments industry. She can be reached at elisabeth.magnor@firstannapolis.com.